Why and How to Put Yourself into Your Family History--Curt Witcher, Amy Johnson Crow, Scott Fisher What a moving presentation. Amy shared some of her family stories and reiterated the importance of recording our stories. "Experiencing stories alter our brains and make us better individuals," said Curt Witcher. Scott Fisher gave us some great points to consider when planning the interview(Who? What? When?) The Q & A portion made me cry. I was reminded of my Grandmother when an attendee asked what to do when interviewing a family member who has Alzheimer's or dementia. I LOVED this session! Blaine covered so many things that we should consider when we are evaluating our DNA matches--Confirmation Bias, Tree Completeness, Pile Up Regions, Small Segment Matches, Segment Frequency, Total Shared DNA. Catch this when they post today's sessions! You won't be sorry! Mike introduced us to the tree Sync feature between the FamilySearch tree and MyHeritage tree and how it was handling exceptions and conflicts in data, especially as it pertained to LDS researchers and maintaining the integrity of the FamilySearch tree. He showed examples of the tree features and MyHeritage's SuperSearch. He also discussed the new tool Theory of Family Relativity that premiered this week. Valerie explained that while the Japanese are excellent record keepers they value their privacy. When researching Japanese ancestry you need to understand the Japanese culture Names are laid out differently. The Japanese have 3 different alphabets and use a different calendar. They also have male heir adoptions and she offered an explanation of that. The Koseki is a Japanese family registry. Why did my Colonial Americans not have those? Very informative presentation. We need research goals and a question we want to answer. "Phrase it in the form of a question. Pretend you are on Jeopardy." Review what you already have....your notes and your sources. Identify holes in your research or opportunities. Use a Timeline. Evaluate your sources. Is there a better source available now? Amy gave a really great explanation of sources, information, and evidence and the two types of each of these. Be sure to check out her genealogy podcast, Generations Cafe. It's available on Apple Podcasts, Google Play, and Spotify. She is a wonderful speaker and above all an inspiring teacher. MyHeritage announced that they are donating an additional 5000 kits to DNA Quest, a project they initiated which is helping adoptees to find their biological parents. 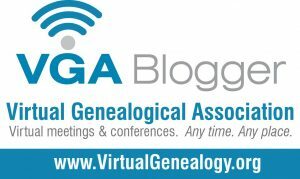 All of today's sessions were great and my news-feed was buzzing with people talking about the new AutoCluster tool at MyHeritage as well as the new Ancestry tools. The Top 5 of my Top 5 Resources.